Fill in your details and we will contact you with the most amazing ADSL2+ Home Bundle offer. If you continue to experience the same problem, please contact TPG on 1300 900 779 for further assistance. Why TPG ADSL2+ Home Bundle? Sign up for ADSL2+ today and we’ll move you to the NBN when your address is ready. When it’s time to move, there’s no setup fee on our 18 month NBN plan which includes a high speed Wi-Fi modem at no extra cost. Router delivery is optional - A $10 fee applies. You require a Filter for each telephony device attached to your nominated ADSL line including cordless phones. * A free Filter/Splitter is included with modem for use with ADSL and ADSL2+. Filter is not required for Naked ADSL2+ If you have more than 3 telephony devices or a back-to-base alarm, please call TPG sales on 13 14 23, then select option 1, then option 2. Click here for information about filters/splitters. Makes and models of modems supplied are subject to availability. TPG’s super affordable home phone line is great value! If you are an existing TPG ADSL2+ customer and interested in the ADSL2+ Home Bundle service, please call Customer Service on 13 14 23 where a friendly customer representative will assist your enquiry. Call connection not charged for the first 100 minutes included in Big Talk Add-on and for all calls to specific international destinations included in Extra Talk Add-on. TPG defines a Local Call to be a call made to a number in the same Standard Zone Unit or an adjacent Standard Zone Unit. To check whether a call is a Local Call or not, please use the TPG Home Phone Call Rate Calculator . TPG's range of services and features help you make the most out of your home phone. This feature is free to customers on ADSL2+ Home Bundle Plans. Call Waiting notifies you if someone is calling on your home phone while you are already on a call. You can place the first call on hold to answer the second incoming call, and switch back again. To use this feature your phone will need to have either the 'recall' or 'flash' button. Call Forwarding allows you to divert calls from your home phone number to a different number. Caller ID allows you to see the phone number of the person calling you on your home phone. This feature is only applicable on the phones that supports Caller ID. Please note not every number will show up, unlisted numbers, numbers blocked by the caller, international calls or calls from some areas within Australia will appear as PRIVATE or UNAVAILABLE. ADSL2+ Home Bundle plans are only available at selected TPG ADSL2+ exchange areas. Contract term x ($(ADSL2+ Home Bundle Monthly Charge) + $(Optional Voice Add-On Charge)) + Setup ($99.95 on no lock-in contract or $79.99 on 18 month contract) + $20 Prepayment + $10 Equipment Delivery (if applicable). Early termination fees apply. Home Phone Line Monthly & Setup pricing is discounted based on new customers agreeing to waive the Customer Service Guarantee (CSG). For more information please contact TPG sales on 13 14 23. This plan is also available as an nbn™ plan. If the nbn™ network comes to your area, TPG will invite you to move your service to the nbn™ network on 18 month contract with Wi-Fi modem included at no additional cost to you. For more information, see our Additional Pricing page. Active phone line - Customers must be able to make AND receive phone calls. You can transfer your phone number from your current home phone provider (Telstra, Optus, AAPT, Primus and others) to TPG + OR get a new number from TPG. An inactive phone line - Phone cabling exists to your house (i.e. you have phone sockets), but no current phone service uses those sockets to make or receive calls. A new TPG service will be connected and customer will receive a new TPG number. In some cases, this may involve a site visit. An active Naked DSL service with another provider - Transfer your existing Naked DSL service to TPG ADSL2+ Home Bundle. Provision of ADSL2+ Home Bundle service is subject to Service Qualification Check upon registration. When TPG ADSL2+ Home Bundle service is active on your telephone line, your contract period commences and you can start making outgoing calls using TPG Home phone service. You should note that, if you are porting your number to TPG, inbound calling to your number will not commence until porting is complete which will take a further 3 to 5 business days. Lead-in cables need to be in place before the activation of TPG ADSL2+ Home Bundle Services can be completed. Please read the following section to learn more about lead-in, installation appointment , jumpering and multiple wall sockets for some Optus customers. + We may not be able to port your number in all circumstances, this includes failure to provide account details, or contractual obligations with your existing provider. For more information visit our ADSL2+ Home Bundle FAQ section. Uploads not counted on ADSL2+ Home Bundle plans. 1Consists of peak (9am-1am) and off peak (1am-9am) monthly usage quota. Speed will be shaped to 256K/256K for the period in which the monthly usage quota has been exceeded (peak and/or off peak). Uploads not counted. TPG Home Phone Line can be ordered as a bundle with ADSL2+ by new customers. If you are an existing TPG ADSL2+ customer and interested in the ADSL2+ Home Bundle service, please call Customer Service on 13 14 23 where a friendly customer representative will assist your enquiry. TPG Home Phone supports fax to national numbers in the Telstra, Optus, AAPT and Primus PSTN network. Fax to international numbers is not reliable and VoIP based fax is not supported. TPG Home Phone does not support EFTPOS, Back to Base alarms, Foxtel program purchase via your landline, analogue modems, calls to 19/1900, 0500 numbers and Universal International Freephone Numbers (UIFN). Once a ADSL2+ Home Bundle plan is purchased, Change of plan option is restricted to ADSL2+ Home Bundle & NBN Bundle (if available) plans only. You cannot cancel either component (ADSL2+ or Home Phone). Cancellation will cease both services. At registration time, you can choose to port your existing number to TPG or have TPG supply a Direct Inward Dial Number (DID) for use with the TPG Home Phone service. This number will be allocated to you based on the address which you provide us at the time of registration. This add-on allows you to make unlimited Local Calls (excluding 13/1300 numbers), unlimited Standard National Calls to Landlines and unlimited calls to Standard Australian Mobiles. Calls to 19/1900 numbers are not supported. Charges for calls made that are not included in the add-on (e.g. calls to 13/1300, International Calls and Directory Services) will be charged at listed TPG rates by deducting usage charges from your Prepayment. The service is for residential consumers only and may not be used for commercial purposes. This add-on allows you to make unlimited Local Calls (excluding 13/1300 numbers) and unlimited Standard National Calls to Landlines. Calls to 19/1900 numbers are not supported. The 100 International Minutes per month included in the add-on can be used to call International Landline and Mobile destinations (excluding calls to satellite phones) listed on our International Call Rates page. Standard per minute rates listed on our International Call Rates page apply after the first 100 minutes of International Calls and for calls to satellite phones. Unused included minutes for international calls expire at the end of each month. Charges for calls made that are not included in the add-on (e.g. calls to 13/1300, AU Mobile numbers and Directory Services) will be charged at listed TPG rates by deducting usage charges from your Prepayment. The service is for residential consumers only and may not be used for commercial purposes. This add-on allows you to make unlimited calls to Landline and Mobile numbers in 15 countries (Canada, China, France, Germany, Greece, Hong Kong, India, Korea (South), Malaysia, New Zealand, Singapore, Taiwan, Thailand, United Kingdom, United States), unlimited Local Calls (excluding 13/1300 numbers), unlimited Standard National Calls to Landlines and unlimited calls to Standard Australian Mobiles. Calls to 19/1900 numbers are not supported. Standard per minute rates listed on our International Call Rates page apply for International Calls to other countries and calls to satellite phones. Charges for calls made that are not included in the add-on (e.g. calls to 13/1300, Directory Services and satellite phones) will be charged at listed TPG rates by deducting usage charges from your Prepayment. The service is for residential consumers only and may not be used for commercial purposes. All TPG ADSL2+ Home Bundle plans come with Static IP address. 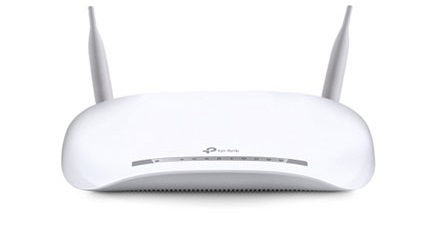 A 4 Port Wi-Fi Modem Router is included in all Home Bundles on 18 month contract. $10 Delivery fee applies if equipment is not collected from TPG's Head Office. Large monthly usage quota with bonus off-peak usage quota. Free 20 email addresses and 30MB web space. If you are getting a new phone number, once your service relocation is processed we will charge you $20 as Prepayment for your new number. Any unused Prepayment for your old phone number will be credited back to your account 3 days after the relocation has completed. #You will be allocated a new TPG username. If you are moving to NBN and you are getting a new phone number, once your service relocation is processed we will charge you $20 as Prepayment for your new number. Any unused Prepayment for your old phone number will be credited back to your account 3 days after the relocation has completed. If you are applying to relocate your ADSL2+ Home Bundle service during the Minimum Contract Term to an area where TPG ADSL2+ Home Bundle service is not available, you have the option to change to a TPG NBN service (current contract continues and moving home fee of $99.95 apply) or ADSL2+ / Broadband Off-Net service (contract restart and moving home fee of $59.95 apply) after an active Telstra phone service has been installed. If you decide not to do this, your service will be cancelled and early termination charge will be applicable of 50% of the monthly charges that would have been paid between the date of cancellation and the end of the contract period, up to a maximum of $350. If you are applying to relocate your ADSL2+ Home Bundle service during the Minimum Contract Term and TPG determines that TPG NBN, ADSL2+ Home Bundle/ADSL2+, ADSL service is not able to be provisioned at the new address/telephone number, your service will be cancelled and remaining portion of the Minimum Contract Term will be charged up to a maximum of $60. # This fee may apply only to customers who registered for a TPG ADSL2+ Home Bundle without an existing active phone line or an active DSL service. The Main Distribution Frame (in a multiple dwelling unit for example an apartment). If additional cabling is required at the customer’s building MDF then the customer can choose to get a private technician to do the work or request a TPG tech. A fee of $59.99 will apply in these circumstances. Please note the service will be delivered to the first side of the MDF (the A side). Any wiring that is missing to connect to the other side (the B side) & into the building requires a technician. Home Phone is a standard telephone service, which is bundled with our ADSL2+ Home Bundle plans. It works similar to your existing traditional PSTN fixed line service. TPG ADSL2+ Home Bundle includes line rental and it allows you to make local, national, 13 and 18, mobile and international calls. You can make phone calls directly through your existing phone sockets with standard analogue or POTS (1900 numbers are not supported). ADSL inline filters are needed to be installed on your telephone. How reliable is TPG’s Home Phone Service? What is the difference between TPG VoIP and TPG Home Phone? Can I use TPG Home Phone for line rental and local calls only and choose another provider for other calls (national long distance, international, calls to mobiles)? For home phone services, you can monitor your actual usage (in near real time), bar outbound calls of various types, and make use of other spend management tools, all via the My Account section of the TPG Website at no charge. For more information about using these tools, please contact Customer Service on 13 14 23. To whom is ADSL2+ Home Bundle available to? In selected TPG ADSL2+ coverage areas to new customers when ADSL2+ and Home Phone Line Rental are purchased as a bundle. If you are an existing TPG ADSL2+ customer and interested in the ADSL2+ Home Bundle service, please call Customer Service on 13 14 23 where a friendly customer representative will assist your enquiry. If you don't have an active phone line to make or receive calls at the location where you have nominated to have ADSL2+ Home Bundle installed, there needs to have been a Telstra phone line previously connected at your premises. If there is a phone socket on the wall, then there has likely been a phone line connected. You may be required to provide the technician with access to your Network Boundary Point (see 17 for more details). Installation appointments that are required to be rescheduled due to you not being in attendance when required will result in additional charges. Please click here for ADSL2+ Home Bundle Additional Pricing. You will be responsible for arranging and paying for any cabling (if required) beyond the network boundary point. TPG will provide you with a new phone number unless you qualify to transfer your existing active phone number at your current location to your new location where ADSL2+ Home Bundle will be installed. I am an existing TPG ADSL2+ customer. Can I switch to an ADSL2+ TPG Home Bundle plan? Once logged in, eligible customers will be shown an option for upgrading to our ADSL2+ Home Bundle plan. I currently have an active phone service at my current location however I will be moving into a new location where there is no active phone service. I would like to install ADSL2+ Home Bundle at my new location. Can I also port my number when I move? What does "active phone number/line" mean? It means you have a dial tone and an active phone number (meaning you have the ability to make and receive phone calls), excluding services provided over VoIP, on the phone line connected to your house/premises you nominate for ADSL2+ Home Bundle. What does Complex Product mean? Complex Products are non compatible services that may be active on an active phone service on which ADSL2+ Home Bundle is to be installed. Only customers who are converting their active Telstra phone service at their current location to ADSL2+ Home Bundle need to ensure they do not have any complex products on the line when they submit their application. What do I need to do if I have complex product on my phone line? Once ADSL2+ Home Bundle is installed, are there any services that will not work on my line? Fax to national numbers in the Telstra, Optus, AAPT and Primus PSTN network is supported; fax to international numbers is not reliable; and VoIP based fax is not supported. Watching standard Digital Pay TV (e.g. Foxtel) programs will still work however services such as voting and On Demand program purchase via your telephone line will not work. If you have the latest Foxtel set top box, you can purchase programs using the Ethernet connection in the set top box to connect via TPG ADSL2+. Can I watch Foxtel if I have TPG ADSL2+ Home Bundle? Does Foxtel On Demand or program purchase work with TPG ADSL2+ Home Bundle? Once I register for ADSL2+ Home Bundle, can I cancel the Home Phone or ADSL2+ component? No, Home Phone or ADSL2+ cannot be cancelled separately. Since ADSL2+ Home Bundle is a bundle plan, cancellation will cease both services. Can I have TPG’s Home Phone Service only (without ADSL2+)? Do I need to call my current provider to cancel my existing home phone or Naked DSL (ULL) service? No. You do not need to contact your current provider to cancel the existing home telephone service prior to applying for ADSL2+ Home Bundle. Once ADSL2+ Home Bundle has been installed, it would be advisable to contact your current provider to ensure you do not receive any further bills. How long will it take for ADSL2+ Home Bundle to become active from Registration? After you have submitted your application, ADSL2+ will be activated in approximately 10 working days but can take up to 20 working days in some cases. Your billing cycle for ADSL2+ Home Bundle will begin as soon as ADSL2+ has been installed. Your phone service must not be cancelled until it is successfully ported to your new location where ADSL2+ Home Bundle has been installed. If the number is cancelled prior to this, porting cannot be done and a new phone number will need to be allocated. Will I still be able to use my current home phone service until ADSL2+ Home Bundle is installed? You will receive incoming calls at your new location as soon as your number has been ported to TPG. In the mean time you can make outgoing calls from your old/current location. Charges for these calls will be made by your current provider. Your current phone service must not be cancelled until the number has been ported to your new location where ADSL2+ Home Bundle has been installed. I have ADSL2+ with another provider. Can I get ADSL2+ Home Bundle? If you have an active phone service and ADSL2+ with another provider at your current location and wish to register for ADSL2+ Home Bundle, you do not need to cancel your ADSL2+ service prior to registering with TPG. You will be able to use your existing ADSL2+ service up until the day where ADSL2+ Home Bundle has been installed. On the day of the installation you may experience downtime of up to 2 hours. Once ADSL2+ Home Bundle has been installed, it would be advisable to contact your current providers to ensure you do not receive any further bills. On the day of ADSL2+ Home Bundle installation, do I need to be present at the location of the installation? Your first telephone wall socket - this applies mainly for free standing premises like a house. The Main Distribution Frame (MDF). This is a small telecommunications room in a common area withinyour block. This applies mainly for apartments, office blocks or larger business premises. In some cases, you may need to contact your building management to arrange access to it. The “network termination device” – this is a Telstra box externally mounted to single dwellings, individual living units or small business premises. I am being asked for my ULL Identifier when registering for TPG’s ADSL2+ Home Bundle service. What is this? I was notified by TPG that there is a “lead-in issue” with my premises. What does this mean and what can I do? I am renting a property and I am not able to gain permission from my landlord to perform lead-in works in the premises. How do I proceed with installation? Unfortunately this means you cannot go ahead with the installation of TPG ADSL2+ Home Bundle. In this situation, you may cancel your application and we will not charge you any cancellation fee. Can I reschedule the installation appointment I have scheduled with TPG? If you wish to reschedule an installation appointment with TPG, please let us know at least 3 working days before the scheduled appointment. Additional charges will apply if you do not give us at least 3 working days of notice. Please click here for ADSL2+ Home Bundle Additional Pricing. TPG has advised me that I need to be home during the scheduled installation appointment time. What happens if I am not home at this time? Additional charges will apply as specified in the ADSL2+ Home Bundle Additional Pricing page. We will contact you to reschedule the installation appointment. What happens if the technician missed the scheduled installation appointment? I was notified by TPG that an extra work or jumpering is required for the cabling in my premises. What does this mean? If you have applied for ADSL2+ Home Bundle and you live in an apartment or a unit, we will deliver your service to the network boundary point of that premises. This network boundary point is typically the Main Distribution Frame (MDF). The MDF is a small telecommunications room in a common area within your block. I was notified by TPG that an extra work or jumpering is required for the cabling in my premises. How do I proceed with installation? There are multiple phone wall sockets in my home and TPG only delivered the service to one of these sockets. I would like the service to be delivered to all sockets or to a different socket in my home. What can I do? I currently have a phone service on the Optus Cable infrastructure with multiple functioning wall sockets. Will these sockets continue to work with TPG? Yes, when registering for ADSL2+ Home Bundle, currently TPG is able to transfer phone numbers that currently belong to the following networks: Telstra, Optus, AAPT, Primus and Powertel. DID stands for Direct-In-Dial. If you choose or will be given a new phone number by TPG, TPG will assign a new DID phone number to you based on the address you will have installed ADSL2+ Home Bundle. It is in a similar format to your existing telephone number <10 digit number>. If you are converting your existing phone service to ADSL2+ Home Bundle which is on the Optus, Primus, AAPT or Powertel networks, you will need to provide your current Account Number provided by your current phone provider. Can I keep the phone number assigned by TPG when I no longer want to have the home phone service with TPG? Does TPG provide diversion services while my number is being ported? If you are converting your existing Telstra phone number at your CURRENT location to ADSL2+ Home Bundle, yes diversion service is provided while your number is being ported to TPG. If someone calls your home number, they will be redirected to TPG Voice Mail. The caller will be able to leave you a voice message for your retrieval. I am eligible for diversion services while my number is being ported to TPG. How will I be notified when I receive voice mail? Can I call emergency numbers with my ADSL2+ Home Bundle service? How can I make a call using TPG’s Home Phone service? 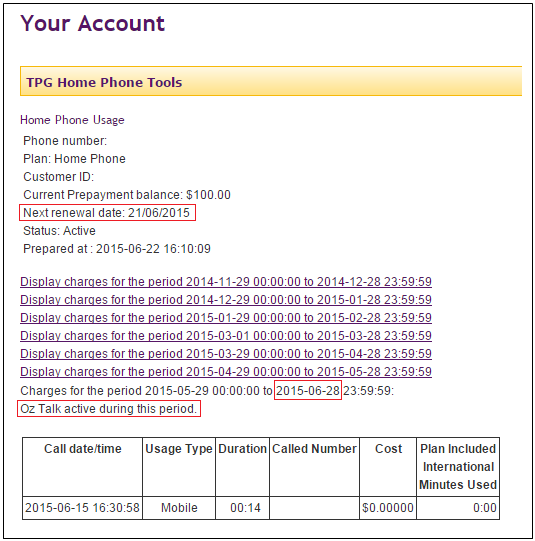 Can I receive Reverse Charge Calls/Collect Calls using TPG's Home Phone service? How am I billed for ADSL2+ Home Bundle? Can I view my call and Internet usage online? How do I list my TPG Home Phone number in the directory? What is a voice add-on? Voice add-on is an optional feature which adds various included calls to your ADSL2+ Home Bundle plan. If a voice add-on is selected, the add-on will form part of the Home Bundle and must be retained until the expiry of the contract term for the associated Home Bundle unless a plan downgrade occurs. What are the voice add-ons TPG offers? We offer three voice add-ons. How do I enable a voice add-on? New customers have the option to select the optional voice add-on at the time of registration for ADSL2+ Home Bundle Service. If you did not select a voice add-on at registration time, it can be requested to be activated via Your Account once the ADSL2+ Home Bundle service is active. Note that the add-on will form part of the Home Bundle and must be retained until the expiry of the contract term for the associated Home Bundle unless a plan downgrade occurs. What happens if I make phone calls which are not included in my voice add-on? Any calls which are not included in your voice add-on will be deducted directly from your Prepayment. Once I have activated the voice add-on, when/how do I get charged the monthly fee and when can I start utilising the included calls? If you subscribe to this feature at the time of ADSL2+ Home Bundle registration, TPG will charge your nominated bank account/credit card for the first month's use of the ADSL2+ Home Bundle and the optional voice add-on feature. This feature will be active from the date that your ADSL2+ Home Bundle service is activated. For Example: An existing ADSL2+ Home Bundle customer's monthly billing cycle runs from 24 July to 23 August. The customer enables the Oz Talk feature before 16 August (at least 7 days before the end of the current billing cycle). 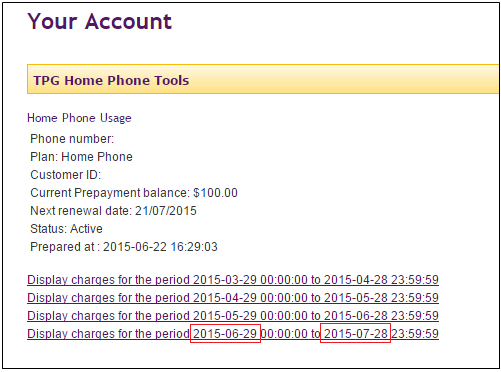 TPG will charge $10 for Oz Talk on the customer’s next billing cycle renewal. Oz Talk will be active as of the start of the next billing cycle (24 August) and customer will be able to make the included calls. If the customer had only enabled Oz Talk on 20 August (less than 7 days before the end of the current billing cycle), Oz Talk will not be active on the next billing period. TPG will only charge $10 for Oz Talk on the billing period renewal after the next, and Oz Talk will only be active on 23 September. How can I check the start and end dates of my current billing cycle? How can I check if I can currently make the included calls in my voice add-on? Can I disable or cancel my voice add-on? You can request to disable your voice add-on via Your Account. Subsequent renewals will not include your voice add-on. No refunds will be issued for cancellations. For customers on no lock-in contract or outside contract: The voice add-on feature is available on a month-to-month contract. If you wish to disable your add-on feature on your next monthly billing cycle, your request must be submitted before your billing cycle renewal (7 days before the end of your current monthly billing cycle). If you request to disable your add-on feature less than 7 days before the end of your current monthly billing cycle, it will only be disabled on the monthly billing cycle after your next one. For customers inside a contract: The add-on will form part of the Home Bundle and must be retained until the expiry of the contract term for the associated Home Bundle unless a plan downgrade occurs. Plan downgrade fee applies. Will I receive an email when I request to activate/deactivate the voice add-on? If you have enabled the voice add-on feature at the time of ADSL2+ Home Bundle registration, a separate email will not be sent. Once your ADSL2+ Home Bundle service has been activated, you will be able to make the included calls. If you enabled this feature after your ADSL2+ Home Bundle service is activated, you will receive a confirmation email. In the email you will be reminded when the add-on monthly charge will apply and from what date it is expected that you would be able to make the included calls. I am an existing ADSL2+ Home Bundle customer, what should I be aware of during relocation? Installation of your new Relocation at the new location will take approximately 10 – 20 working days. We cannot relocate your ADSL2+ Home Bundle service if the service is not available at your new address. You have the option to change to a TPG ADSL/ADSL2+ plan (will applicable charges and contract restart) after an active Telstra phone service has been installed. If you are inside a contract, your current contract term will continue. How do I cancel my ADSL2+ Home Bundle service? Do I have to pay early termination fee if I cancel my ADSL2+ Home Bundle service before the end of contract term?